A90: Three people died in the crash. 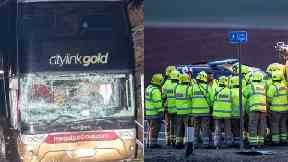 Three people killed in a car which collided with a bus on the A90 have been named by police. The smash involving the Citylink coach, a red Renault Megane and a Ford B Max took place between Aberdeen and Dundee at Glenbervie at around 4.30pm on Tuesday. The three people who died, two men and one woman, were passengers in the Renault Megane. Police have confirmed the victims' names as Zaharina Hristova, 37, Silyan Stefanov, 42, and Dimitar Georgiev, 32, all of Bulgaria. None of the passengers on the bus were hurt but the driver sustained minor injuries. The man and woman in the other car involved, a Ford B Max, were also taken to Aberdeen Royal Infirmary where their injuries were described as not life threatening. Marin Rachev, who was the driver of the Renault Megane, was charged in relation to alleged road traffic offences and appeared at Aberdeen Sheriff Court on Thursday. The 34-year-old faced a charge of causing death by dangerous driving. He was remanded in custody pending a further hearing next week.